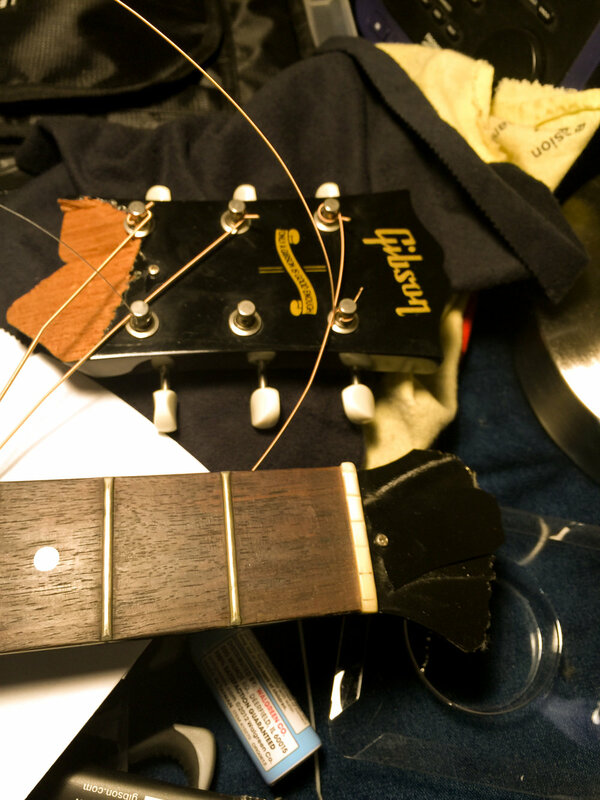 It’s been nonstop touring lately, which means the wear and tear on my precious guitars have been adding up. Although I fly with my two favorite guitars on the plane, in a special double acoustic/electric guitar bag made by Mono, heavy playing and transporting them around can cause problems. Last year, my Gibson LG2 acoustic fell off a guitar stand on stage. The neck broke-off at the headstock. You can imagine how unhappy I was. Normally, I request Hercules guitar stands because they are sturdy. However, some venues don’t invest in professional guitar stands. I thought the guitar was ruined. I phoned Gibson about maybe getting a replacement, but unfortunately, the Gibson company are having some problems of their own these days. They were unresponsive, I wasn't surprised. Then I remembered, when I lived in New Orleans — before Katrina washed me a few miles north of the city — I would take my acoustic guitars to Salvador Giardina, a master luthier, in Old Metairie (New Orleans). I called Sal and explained the break and he just laughed. I thought to myself, why he is laughing? Turns out Sal has seen hundreds of panicked guitarists. He laughs because they needn’t worry. He said he could have it as good as new in 24 hours. I left my LG2 with Sal and returned the next day hoping for the best. I was pleasantly surprised to find my favorite acoustic looking good as new. I could hardly believe it! Sal did such a great job I couldn’t even see where the break was. Since then I’ve had Sal work on several of my acoustics. A note about my Gibson LG2 parlor guitar: Because I mostly use the LG2 with a slide, I use very heavy gauge strings. I use a customized set, .018 (naked) .022 (naked) .026, .035, .045, .056 Elixir poly-web warm strings. The heavy strings provide the tension I prefer but, it stresses the neck and bridge. To prevent stress problems, I always detune when the guitar is idle. 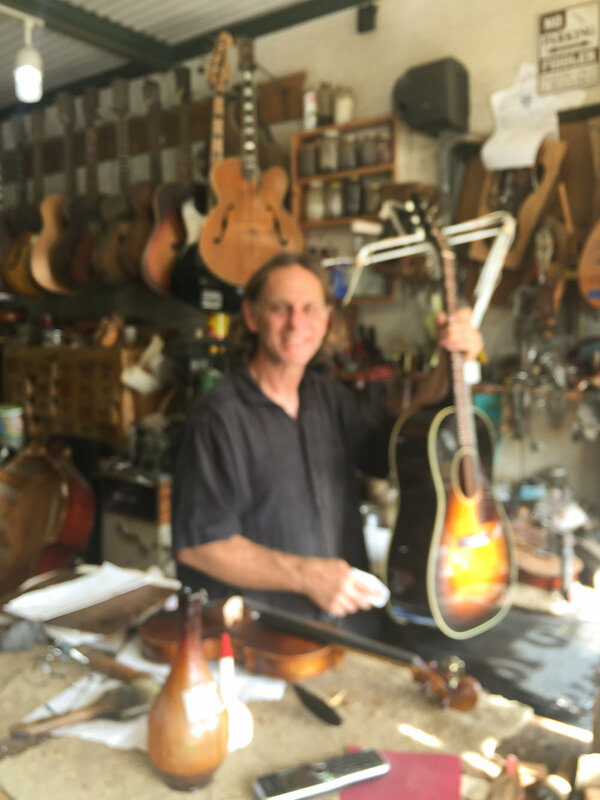 Holding my repaired Gibson LG2 in his shop in Old Metairie. Sorry for the blurry picture. Last week Sal worked his voodoo on three of my acoustic guitars. A Gibson J-45, a Steel Dobro, and a Fender Classical. The body of the J-45 was split in the back and was coming apart. It happened on a flight because of air pressure, I believe. The Dobro’s neck was broken, similar to the LG2. The classical only needed maintenance. 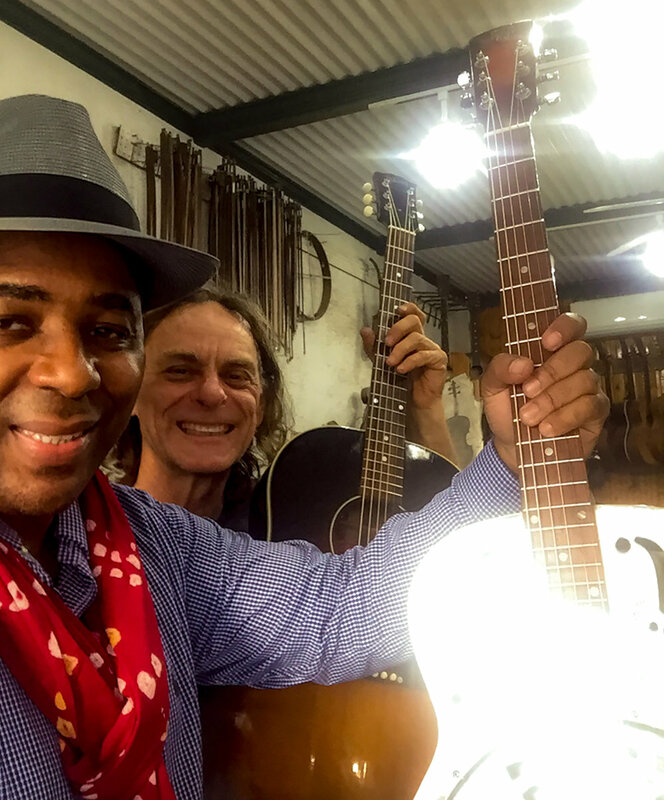 I'm holding the repaired Dobro, Sal is holding the repaired J-45. It took about a week to repair the J-45. Cosmetically, the scar is still there, (I wasn’t interested in a major refinish) but Sal fixed it right up. The break on the Dobro was undetectable. Sal also did some fretwork and adjusted the neck. The Dobro feels and plays better than ever. The classical guitar's frets were honed, and the neck adjusted. It too, feel better than before. Next up for Sal is my Martin 12-string and a Martin 6-string. I’ll also take the J-45 back to him soon to have the frets redone. I’m very pleased with the way my week went. Now if I only can find the time to play them all. So many guitars and so little time. "The King of New Orleans Blues" Copyright 2017 21st Century Blues, LLC and Chris Thomas King, LLC. Used by permission.